Light Duty Cart Light duty Panel Cart has 5" x 1.25"
non-marking wheels, 1" blue square tubing. Used for moving materials and equipment. 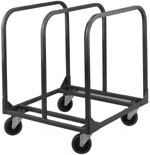 Heavy Duty Panel Cart has 6" x 2" non-marking wheels, 1 1/4" round removable handles. Used for moving materials and equipment. length rubber tread and 3 1/2"